I suppose this photo is upside down because I shot it on my iPad and since I'm left-handed, and the iPad can be used in any direction, I tend to use it with the home button on the left which probably makes the photo upside down in the traditional sense. Anyhow, I just spent 4 days in training that I'll talk about below, and from the first morning I made the point of announcing to the instructors that I doodle compulsively, and that if I'm not allowed to doodle my mind will wander instead. (I didn't want them to think I wasn't paying attention. I was.) This doodle was opposite the agenda in our binder of materials, so I returned to the doodle every day. Here it is right-side up. Sorry I don't have the agenda right-side up too! My 4 days of training were spent in Albany, NY at the NYSUT building. (That's the NY State United Teachers for those of you who don't recognize the initials.) I was training with the ELT program which is their education arm, the Education Learning Trust) for those (most) of you who wouldn't know this. This training was for new instructors, to introduce us to the program. There is another week of training in August, held in Lake George, where instructors are trained in a specific course that they will be eligible to teach. Each year, instructors attend this training and take/add another course to their repertoire. You might have recalled my talking about this opportunity here. The concept of ELT is that teachers are teaching teachers; who would be better? ELT provides a menu of offerings including graduate classes for graduate credit (through several universities) or for inservice credit; and also seminars, workshops, and more. Courses are offered at locations selected by the instructors, who operate as independent contractors. So they can be offered in your own school district for example, and thus make it easier for people to get courses they need without having to travel. Courses are also available online and on CD. However, I would not be eligible to teach courses for graduate credit, because, ironically, I do NOT have a masters degree (though I have 36 grad hours). Certification regulations did not require it when I became certified, and I didn't live in a location that had access to a degree program that related to me, so I never pursued it. Big mistake maybe, but too late to fix now. Back to my week. We talked about adult learners versus the kids we usually work with, we learned about the structure and hierarchy of the program, the types of classes offered, how to schedule and drum up students for your classes, the portfolio expectations, the grading rubrics, and more. The small group of trainees (9 of us) spent all our time together and worked together nicely. The program ended Thursday with each of us demonstrating our presentation skills with a presentation of our choice that incorporated technology, and a subsequent private evaluation with the instructors. We had been asked to bring something with us that we could use. Everyone knew, going in, that I was different from the rest of the group. I do not have my masters degree. I have not taken a grad class in, um, DECADES. I have never graded a written portfolio. I have taught many adult workshops but they were about stuff like how to use papier-mache with kids or how to fold a trihexaflexagon. So this was a smidgen out of my comfort zone. But I consider myself an intelligent and articulate person and I was told they were looking for a new voice for the organization that included the arts, since they currently have nobody. So I was a little stunned when the instructors said they had something a little 'different' planned for me. They thought my PowerPoint was lovely, but wished that I had involved the class more (I guess I should have brought them each a book to fold? Keep in mind, we only had about 10 minutes and my presentation was culled from a former 50 minute workshop, so I didn't think there was time for a more interactive element.) It as clear the instructors didn't know quite what to do with me. The courses I am most suited to teach (Multiple Intelligences, and anything that has to do with the brain, which REALLY interests me) are taught ONLY for grad credit because of the universities involved, and therefore I am not eligible to take/teach them. I cannot teach courses such as data management, or reading in the content areas, or beginning literacy, or other offerings, because they do not think it would be appropriate. I've got to say, I'm a little upset and angry. I have spent years reminding people that I am a TEACHER first, and art just happens to be my subject area of choice. I was my local union president for 10 years and in positions of leadership for many more. I have taught workshops to other art teachers for the past 9 or so years and have gathered a following of workshop 'groupies'. I am a freak when it comes to spelling and grammar and often have been called upon to edit what others write. As I said before, I consider myself to be intelligent and articulate. But here's what it comes down to. I guess I'm still 'just' an art teacher. Grrrr. They want me, as a retiree, to help present workshops and seminars in schools. In other words, they want me simply because I am retired. Active teachers can't do workshops in other schools during the school day. In August, the others from my trainee group will arrive to take their class from Sunday through Thursday, and then head home. On Thursday, as they head for home, I will arrive and participate in a two day training. None of my wonderful trainee group will be there. I do like the idea of presenting workshops and seminars, but am appalled that they don't think I am capable to take/teach a course. I was always an excellent student academically (other than learning French) and I feel quite rejected, diminished. I also feel that I was misled. I had been through the requisite application process. I had gotten a recommendation from an administrator in my building who used to be an ELT teacher. I had completed the interview successfully and was no more nervous about the training than any of my other classmates in the program. I had only just retired the week before, yet I sat all week in training rather than celebrating my first week of retirement. I could have been out on the lake in my kayak instead of learning to use the online class management/grading system. I could have been sitting on the dock with a good book rather than learning the grading rubric for the courses I would not be allowed to teach. I emailed my classmates to let them know I would not be seeing them in August and some responded that they were surprised and disappointed; I provided a "piece missing from the puzzle". I guess now I need some time to process this and decide whether I even want to go at all in August, or whether I want to back out of the whole thing. I think I could provide something unique, but if they are having trouble seeing where I fit in, maybe I don't really belong at all. The big irony is that I did NOT seek this job; I was contacted specifically BECAUSE, I was told, I offered something they were currently lacking. I guess that's enough for now. Next on my list of things to accomplish today is submitting my workshop proposals for my state art teachers' conference in the fall. At least I know that they want me! The tables are clean, the shelves are empty, and the bulletin boards are bare. The door is locked and the keys have been handed over to the new art teacher. I've spent the past 37 years teaching in NY state public schools, 27 of those years in my current district, and 13 in my current building and room, which was brand new when I moved in. So I have been the first and only tenant in this classroom. But now it belongs to someone else. The ritual of honking and waving is over. Yesterday was our annual end-of -year luncheon and these were the cute cakes. Today friend 'C' spent a lot of time in my room helping me clean and sort. 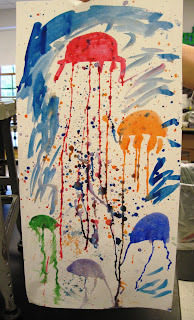 We came across this self-portrait I did several years ago, when some students were painting their own self-portraits. My glasses have changed, and my hair has less dark left in it, and I wasn't wearing my punctuation earrings today, but otherwise I guess I haven't changed much. A lot of people stopped in my room to say goodbye and ask how I felt. Truth is, I feel just fine, though tired. (I've spent the last several weeks with the philosophy of a Warren Zevon song: "I'll sleep when I'm dead".) But I did not even get emotional. My favorite goodbye was from the male 2nd grade teacher (a really cool guy who now owns my frog). He walked by me on our way back from the waving, and said "I don't do goodbye." I said "me neither" and we both kept walking. If I had been at all unsure or ambivalent about my choice to retire, the last several weeks have made it much easier. NY State's new regulations regarding student assessments and teacher evaluations, which seem to change on a daily basis, have everyone stressed to the max. In the final days of school, many teachers were stuck in training, or writing SLO's, or doing other stuff related to the new regs that took them frequently out of their classrooms on their last days with their students. Meanwhile, a couple of key staff cuts mean some challenges for elementary scheduling and teaching for the coming year. Our school has always had a K-12 library and one librarian, with a full time library aide. 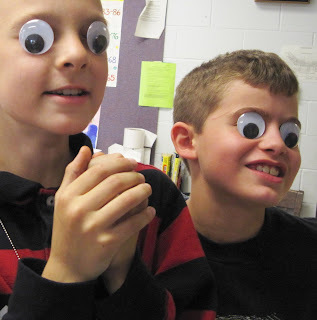 With the position of her library aide cut for the coming year, how does the librarian teach elementary library classes if she has high school students at the same time needing library services? And with the elementary computer class being discontinued, and the former computer teacher becoming the new art teacher (my replacement), the elementary teachers will be expected to do all the computer instruction, which is especially important this coming year as they have been told that a technology element needs to be incorporated in all subject areas. Who will the teachers go to when they need help? I know if I was still going to be teaching, it would be a problem for me because I have ZERO experience with teaching computers. I know none of this is my problem any more but I feel for the challenges my colleagues will face. The stress has been evident throughout the building. One last thing here - way back when I was still a college art ed student, one tidbit told to us students by our professors really stuck in my mind: an art teacher should always take the time to make friends with their custodians, as they are your most important allies. For those of you newer teachers, let me tell you, this may have been the most important bit of real world advice that I learned in college. I can't thank my wonderful custodians enough for putting up with me and all my messes, for watering my (many) plants on vacations, for hauling heavy stuff out of and into my car, for hanging framed student artwork in the halls, for just generally being good, kind, nice, helpful people, and for so many others things I can't name here. Thank you Dawn and Dan and Randy and Tim and Joe and Jerry and all the others in years gone by. You are the best! They took very good care of me. And thanks to the college profs that had the good sense to make sure they passed on that important tidbit of advice to their students. So have a good summer, but keep visiting because I'll still be blogging! We watched as some of our friends were packed into a box and left the room yesterday with our mom. We saw others leave with teachers who picked them up, renamed them, and took them to their new homes (a flying pig to a 3rd grade teacher, an iguana to the other 3rd grade teacher, the goofy 4' tall totem pole to a 4th grade teacher, a cat to a social studies teacher, a penguin to a special ed teacher, etc.) BUT WHAT ABOUT US?! Yes, this full box of my papier-mache samples made it safely to my home today, loaded with: two Laurel Burch cats, an African-style vessel; three large rain sticks; 2 light bulb maracas; a red, white, and blue pig; a garden gnome; and 3 ice cream cones. And as you already know, the dragon left the art room last Friday. But my little friends at the top of the post shouldn't worry. Actually, as of this afternoon, dapper Mr. Frog already is in a new home, sitting above the cubbies in a 2nd grade classroom, a really fun place with a cool teacher who does lots of hands-on science. He will be very happy there, I'm sure. He actually had several people hoping to adopt him, but I think I chose the best home for his personality. Meanwhile, the goofy guy on the left will probably come home with me (I'm rather attached to him) and baldie on the right, actually an unfinished project who was supposed to have a glamorous hairdo, will either find a new home at school or stay in the art room with the new teacher, and with the mummy, the giant crayons, and the dragonfly. I have two days left. So today my 2nd graders cleaned the tables with shaving cream. BEST ART CLASS EVER, they declared, which made me wonder why I bothered to do all that other stuff that required real preparation! After all, all today's lesson needed was a couple of dollar store shaving cream. Check out the last pic to see what someone wrote. iPad users - a little advice please? OK, so this photo doesn't have anything to do with this post. I just drive past this sad little guy every day and yesterday had to stop and take his photo. He looks so lonely and bewildered. If I wasn't afraid of getting arrested I'd paint him a companion on the unpainted barrel. I've had my iPad for a little more than a week now and I love it, but I'm still figuring out exactly what I want to use it for. For starters, as a lifelong Scrabble addict, I've got several games of Words With Friends going and it has reinvigorated some otherwise stale friendships. (I love that there's a place where you can send little chat messages while you are playing.) Cool. I'm learning who among my acquaintances is a good WWF competitor and who I don't really want to play with (it's no fun to totally smoke someone). And I'm dabbling in a couple of sketch/doodle apps, and loving the ease of getting on the internet, and mostly doing a bit of exploring my options. I'm a newbie. But there are two things I do on my laptop that I would like to be able to do on the iPad, but so far I have not been successful with either: posting to this blog, and visiting Pinterest. I tried apps for both that I think must have been meant for the iPhone, since the profile was small on the screen. If you do either of these things on your iPad, can you tell me which apps you use? Any other app favorites you'd like to mention that you haven't told me about previously? Or little hints that might make me go "AHA!"? And if you are a good Scrabble/Words With Friends competitor, and want to play with me, let me know. There's always room/time for another game! There is NOT a dragon in the Art Room. As our time at North Warren Central School winds down, Lucy had to find a new place to live. I think she'll be happy at Loon Lake. When she was more acclimated to the environment, she relaxed on the dock, and explored the woods, even practicing a little tree-climbing. Tired out, and hot from the sunshine, she headed to the bunk room for some rest. I think perhaps she's worried about Sparkle, her baby, who hasn't left the art room yet. Sparkle suffered some injuries this year and needs a little surgical intervention from the dragon doctor (me) but I have assured Lucy that Sparkle will be joining her when she is healed. In the meantime, perhaps she can find some friendship in some distant relatives already residing in her new neighborhood, such as this lovely dragonfly I spotted today. Here are some views of Lucy's new home. The Adirondack chair on the porch is the traditional retirement gift from my teachers' union. On the right is the plaque on the front of the chair. Pretty cool, huh? A while back, I chose to participate in a Creative Challenge offered by Xinme (aka Paula) at her blog Created to be Creative. Yesterday a package arrived in the mail, and I was blown away by the contents. There was a beautiful wire-wrapped necklace on a sparkly red ribbon, and an adorable wire and bead dragonfly on a clothespin. (I happen to adore dragonflies, so this is really special.) Even their packaging of the gifts was lovely. If you aren't a reader of Paula's blog, you probably don't know the personal challenges she is facing. She has been fighting a courageous cancer battle for some time now, but her spirit remains strong and her faith in God is the core of her strength. She is an impressive woman. From the bottom of my heart, Thank you, Xinme, for making me this lovely gift when you have so many more important challenges on your plate. The Creative Challenge is sort of a 'pay it forward' challenge. I want the people who accepted the challenge from me to know that I haven't forgotten them; I've just been crazy busy all spring. Once school is over (in another week) and I get through training for my new little job (the week following the end of school), finishing the creative gifts that I started a while ago will be at at the top of my 'to do' list. I hope they will be worth the wait! This happy face sunshine finger puppet has a moon companion that I unfortunately forgot to photograph. The sun has a gold glittered face, which didn't photograph so well. When my blog was brand new, I posted here about making these fun and easy finger puppets. If you want details of how they are made, check out that post. and finally, on the left below is a favorite elementary teacher who tells the kids she LOVES Elvis, and on the right is Elvis. Unfortunately I didn't get a photo of Elvis after his hair and face was done. Lots of other adorable ones never got photographed: a piglet, a penguin, some butterflies, a shark, an alien, a dementor (from Harry Potter), some zombies and zombie hunters, a police officer, and more. My 6th graders had such fun making these! 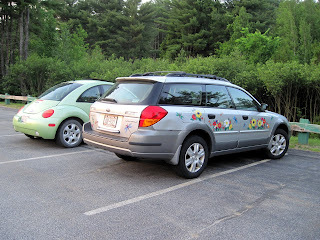 These two cars belong to me and friend 'C'. 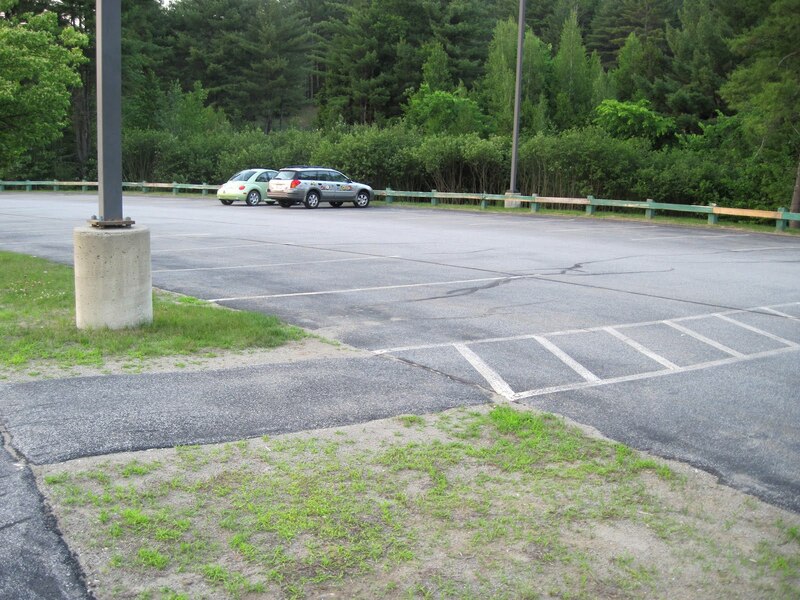 They are frequently the last two cars parked in the school lot. 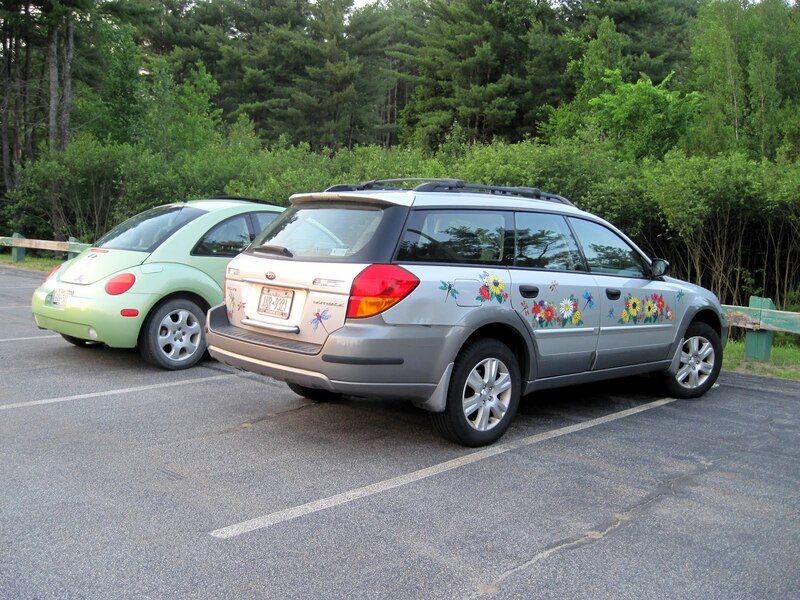 It's cute to see the two hippie cars snuggled together in the lonely lot. At least they have each other. As do me and 'C'. I'm going to miss her next year. 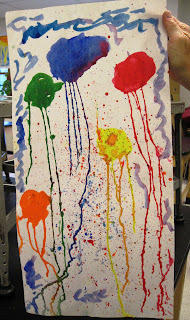 Kristin at For the Love of Art posted this fun easy lesson and I didn't change much about it at all. 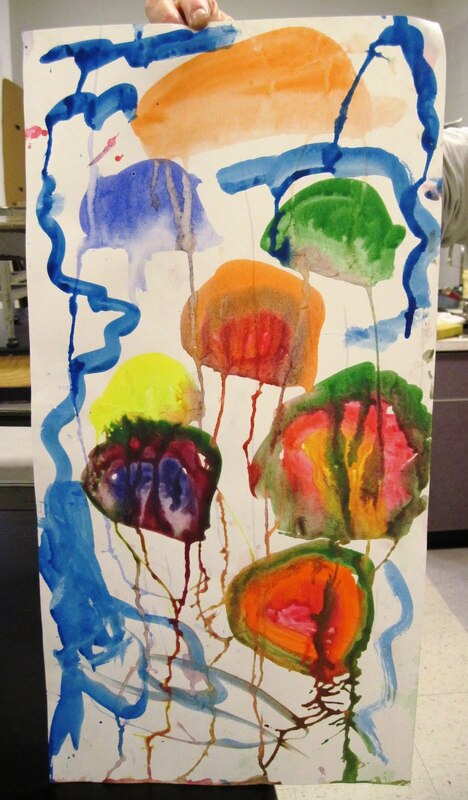 The 1st graders loved making these fun drippy jellyfish with watered down tempera. Somehow these are the only photos I snapped. 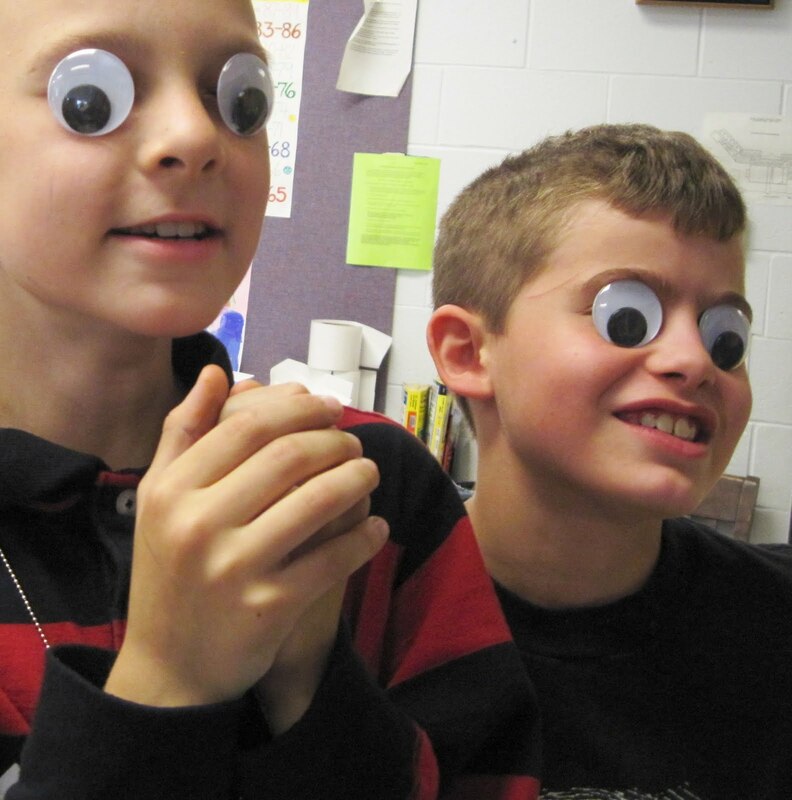 Otherwise, things are getting a little weird in my art room... who can resist a pair of giant googly-eyes? 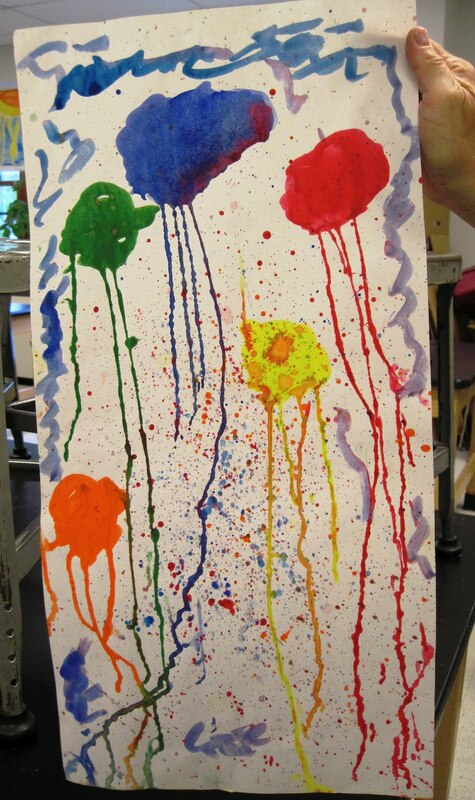 Jackson Pollock paintings by 4th grade, and more spontaneous abstract works are complete! 2nd graders made some great collages with scrap materials, and 3rd graders combined oil pastels, baby oil, and black tempera for some fun paintings.